On Saturday 14th November the IPSC will hold a National Rally Against Apartheid in Palestine & The Siege of Gaza. We are asking people to assemble at 2pm at the Spire on O'Connell Street and to bring banners, placards etc. 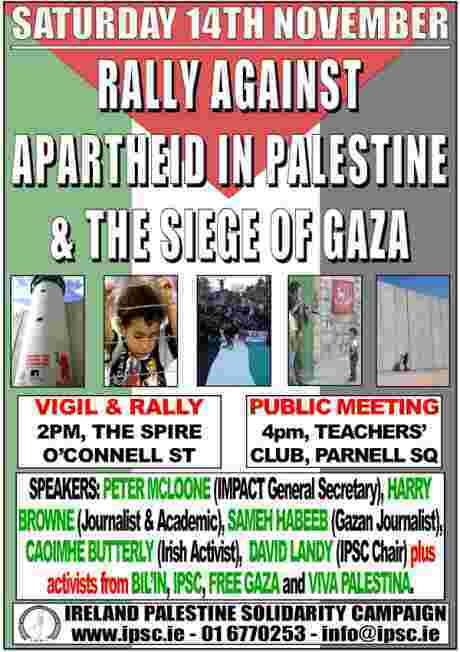 The rally will be followed by at 4pm by a public meeting in The Teachers' Club, Parnell Square, Dublin 1.